We loved having Anil Kaul, CEO at AbsolutData join us to talk about artificial intelligence. ".... we went from using data quite literally and quite directly to now using information to make conjectures and to create new experiences for customers. I think maybe five years ago, the big buzzword in B2B was maybe "social selling," "social media." A couple years later "account based marketing" and then we start talking about AI and I think there has been a lot of interest in artificial intelligence, a lot of discussion. I think inevitably that initial frothing turns into, "Well what exactly is it and how do we use it?" And you guys really have been at Absolutdata at the forefront of this. 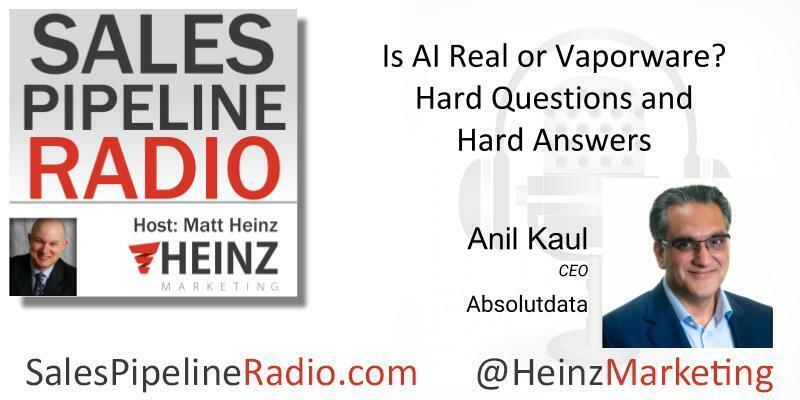 Listen as Anil talks about what AI means to him and about some of the practical applications that can help more marketers or more business leaders wrap their arms around how to leverage it.